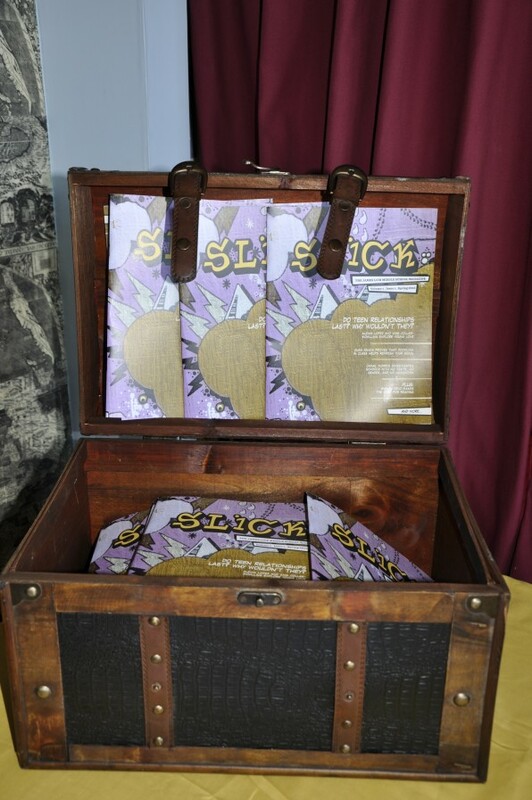 James Lick Middle School was buzzing with excitement on the morning of Slick magazine’s release party. As the newly published writers filed into 826 Valencia’s Writers’ Room, they were met with stacks Slick—hot off the press. Teachers, 826 tutors and parents were seated and the students were given a chance to discuss their writing experiences as well as reading (for the first time!) their published work. In between munching on purple and yellow celebratory cupcakes, students were finally able to dig into Slick. Volume 2, Issue 2 of Slick is filled with topical articles and vibrant writing. In this issue students tackled a variety of subjects, including Hitchcock’s cinematic influence, the thrills and dangers of roller derbies, the infamous Zetas drug cartel, the joys and perils of YouTube, and the components needed for a good relationship. This 47-page issue features the work of 24 young writers. Copies are at the Pirate Store now—get yours before they’re all gone! This entry was posted in 826 News.